All was calm in the Windy City for this Waldorf Astoria Hotel wedding photograph. 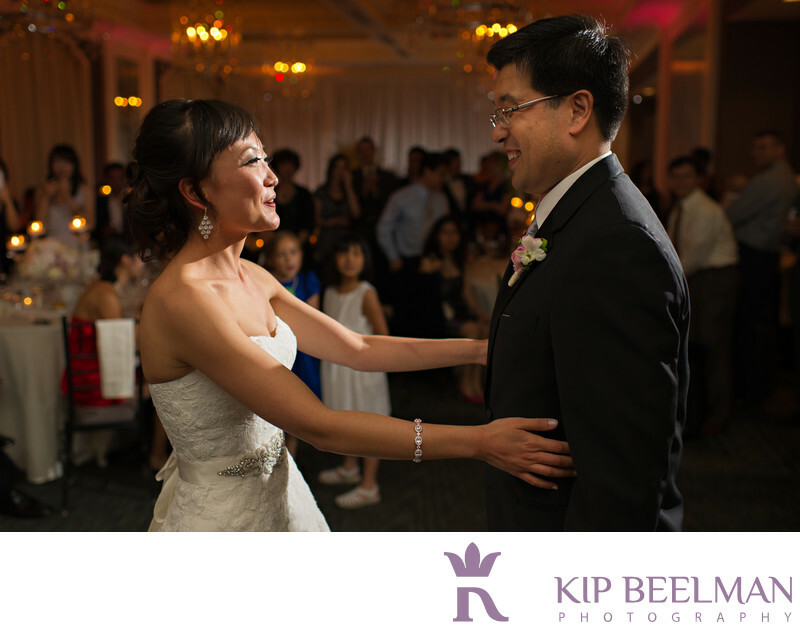 The Chicago wedding in the Gold Coast neighborhood was truly a golden occasion of delight, dancing and dreams come true for these newlyweds. In keeping with the neighborhood’s tradition, the Waldorf Astoria Hotel’s entrance is a cobblestone courtyard that was designed to mirror the grand hotels of Paris in the 1920s. The hotel itself offers storied traditions and storied ballrooms, including the Faulkner Salon where the groom and his groomsmen hung out and where we took some fun wedding photos. With a dramatic ink drawing of the Titanic, the Faulkner salon featured metal drum light fixtures, custom drapes and a real sense of ambience. The literary romance continued in the Hemingway Salon, decorated from centuries past with dramatic, artistic chandeliers, floor-to-ceiling windows with a view of the courtyard and artful touches, where the couple held their cocktail hour. The tour concluded in the Sinclair Ballroom, where the couple was married and hosted their wedding reception. Like the welcoming and historic courtyard below, the artful and glamourous Sinclair Ballroom was designed to emulate Paris in the 1920s. The walls are coated in silk, beautiful hand-blown glass and crystal chandeliers were inspired by vintage jewelry, and a charming fifth-floor terrace offers a view at the neighborhood and the world below. Combining a bit of history with the present moment and a peek at the future, this Chicago wedding photography offered the perfect marriage of old-school charm and fresh visions of true love. Props and xoxo's to Brett and Kiri from Pen Carlson for having me there. Location: 11 E Walton St, Chicago, IL 60611. Keywords: Chicago (3), Hotel Wedding (48), Waldorf Astoria Hotel (3).